Summer is right around the corner, and while you’re busy working on that beach body, stocking up on bathing suits, and planning your sun-filled getaways — you might also want to consider sampling the best sunscreens that summer 2017 has to offer. Consumer Reports just released their annual list of top sunscreens, with some important reminders. The number on the bottle isn’t always accurate: Of the 58 lotions, sprays and sticks rated by Consumer Reports this year, 20 of them tested at less than half of the SPF listed on their label. For example, one sunscreen they tested was labeled SPF 30, but the UVB protection it actually provided was between 10 and 19. 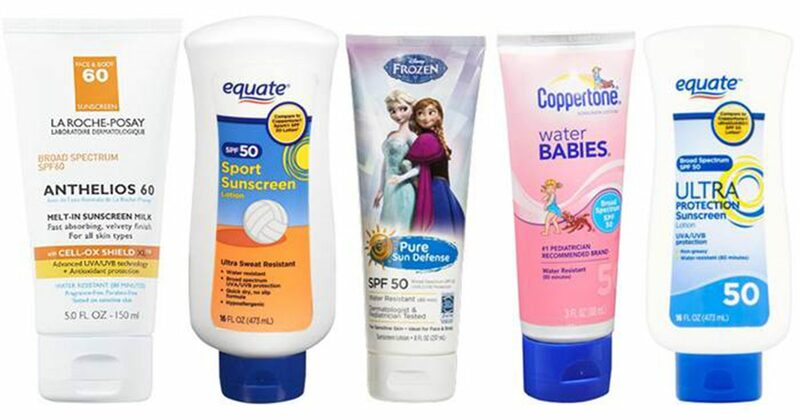 These are a few of the top-rated sunscreens, according to Consumer Reports. If you opt not to use any of the products listed above, Consumer Reports recommends using a sunscreen with an SPF of at least 40. If spray on sunscreen is more your vibe, Trader Joe’s Spray SPF 50+ received an excellent rating, along with Banana Boat SunComfort Clear UltraMist Spray and Equate Sport Continuous Spray SPF 30. Consumer Reports points out there are a few things to keep in mind when using a sunscreen spray. “You have to hold the nozzle close to your skin, and don’t spray the product into the wind. You often see parents running behind kids on the beach, spraying. That’s not an effective way to apply sunscreen,” Joshua Zeichner, M.D., director of cosmetic and clinical research in the dermatology department at Mount Sinai Hospital in New York City said, in the report. For proper use, you should also take care to run in the sunscreen after you spray it on — a practice that not all users are aware is important for proper coverage. Reapply every time you get out of the water. Regardless if the sunscreen is deemed to be “waterproof”. For more information, check out the full story on Consumer Reports.